There are a variety of actions that can be implemented by transit agencies and their partner organizations to improve safety for pedestrians traveling to transit. These actions include engineering (physical infrastructure), education, and enforcement efforts. The most successful strategies often involve a combination of these treatments. Good pedestrian design should account for the needs of all potential users, including those with physical or mental limitations. The design of paths, sidewalks, and transit stops contribute to a passenger's experience and perception of safety on the transit system. Well-connected sidewalks should be installed in all areas with regular transit service so that transit patrons will not be forced to walk in the street while traveling to or from a stop or station. In addition, roadway crossings should be made safer with an appropriate combination of facilities, such as marked crosswalks, median crossing islands, warning signs, and pedestrian signals. FHWA Designing Sidewalks and Trails for Access, Part I, A Review of Existing Guidelines, https://www.fhwa.dot.gov/environment/bicycle_pedestrian/publications/sidewalks/. FHWA Designing Sidewalks and Trails for Access Part II, Best Practices Guide, https://www.fhwa.dot.gov/environment/bicycle_pedestrian/publications/sidewalk2/. 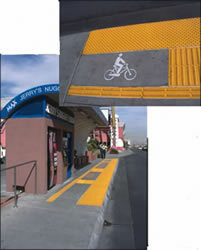 AASHTO Guide for the Planning, Design, and Operation of Pedestrian Facilities, https://bookstore.transportation.org/item_details.aspx?id=119. Creating safer places for pedestrians to travel along roadways can encourage more people to use transit systems. 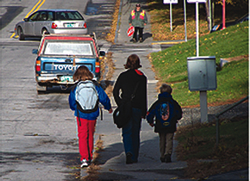 It is critical to ensure that sidewalks and other pedestrian pathways have appropriate width, surface, separation from motor vehicle traffic, lighting, and signage along roadways. TCRP Report 125, Guidebook for Mitigating Fixed-Route Bus and Pedestrian Collisions. This guidebook was developed to	provide guidance to transit agencies on preventing collisions between buses and pedestrians and reducing the severity of collisions that do occur. Factors contributing to crashes are explained to improve understanding of how and why crashes occur. Strategies discussed for mitigating the collisions include traffic engineering improvements, driver training, and public education and outreach. Sidewalks should be wide enough to accommodate the expected levels of pedestrian traffic. Narrow sidewalks that cannot accommodate the volume of foot traffic may encourage pedestrians to walk in the roadway or take alternate routes, increasing the potential for conflict with motor vehicles. It is desirable to provide a sidewalk clear width (i.e., lateral space available for pedestrian travel for the length of a corridor) at least wide enough to accommodate two people walking side-by-side.36 ADA guidelines specify a minimum clear width of 5 feet to accommodate users in wheelchairs.37 In areas with high pedestrian volumes (often areas near transit stops and stations) sidewalks may need to be wider to accommodate pedestrians. Street furniture (e.g. pay phones, trash cans, newspaper racks, etc. ), utilities, and street trees present obstacles to pedestrians, and reduce the sidewalk clear width. Obstacles should be placed outside of the normal pedestrian travel path ideally in the buffer zone (i.e., between the street and the sidewalk) to ensure direct pedestrian paths are provided. The full clear width of a sidewalk should be paved with a smooth, stable and slip-resistant material to accommodate wheelchairs, bicycles, and strollers. The sidewalk should be clear of obstructions, including overhanging branches, utility poles, and signs. For the safety and comfort of pedestrians, it is often desirable to provide a buffer area between the sidewalk and roadway (i.e., sidewalks should not be located against the curb, directly adjacent to the lanes of moving traffic). Some form of buffer should be included to protect pedestrians from noise, wind, and vehicle splash caused by passing vehicles and errant vehicles. Landscaping, such as a simple grass strip, shrubs, and/or trees can be used. A tree-lined buffer has the added benefit of improving roadway aesthetics, providing shade, and improving pedestrians' perceptions of safety with respect to motor vehicle traffic.38, 39 On-street parking can also serve as a buffer between moving vehicles and pedestrians while simultaneously slowing vehicular traffic. Driveway crossing design is important for providing safe, accessible sidewalks. Grade changes between the sidewalk and the driveway should be minimized. Corner radii should be made as small as possible to encourage drivers to turn slowly and yield to pedestrians. More details can be found in the ADAAG. Ample, consistent, and uninterrupted lighting is helpful in ensuring the safety and security of all pedestrians, including customers accessing transit. The FHWA guide, A Resident's Guide for Creating Safe and Walkable Communities (FHWA-SA-07-016), includes more information about lighting requirements for pedestrian facilities. (http://safety.fhwa.dot.gov/ped_bike/ped_cmnity/ped_walkguide/). Directional signage should be installed around heavily-used transit stops to direct passengers to local points of interest. Signage should be scaled for pedestrians and should be designed to be understood by all pedestrians, including those with visual impairments and limited English proficiency. Visual obstructions, such as large shrubs or utility boxes that impair the ability of drivers to see pedestrians should be avoided. ADA Accessibility Guidelines for Buildings and Facilities. United States Access Board, 2002. http://www.access-board.gov/adaag/html/adaag.htm. AASHTO Guide for the Planning, Design, and Operation of Pedestrian Facilities. American Association of State Highway and Transportation Officials, 2004. Pedestrian and Transit-Friendly Design: A Primer for Smart Growth. R. Ewing for Smart Growth Network in Florida, 1999. http://www.epa.gov/smartgrowth/pdf/ptfd_primer.pdf. Designing Sidewalks and Trails for Access, Part I of II: Review of Existing Guidelines and Practices. US Department of Transportation, Federal Highway Administration, 1999. https://www.fhwa.dot.gov/environment/bicycle_pedestrian/publications/sidewalks/. Accessible Rights-of-Way: A Design Guide. United States Access Board, 1999. http://www.access-board.gov/prowac/guide/PROWGuide.htm. PEDSAFE: Pedestrian Safety Guide and Countermeasure Selection System. U.S. Department of Transportation, Federal Highway Administration, Authors: D.L. Harkey and C.V. Zegeer, September 2004. http://www.walkinginfo.org/pedsafe/. Pedestrian Facilities Planning and Design Handbook. Florida Department of Transportation, 1999. http://www.dot.state.fl.us/safety/ped_bike/ped_bike_standards.htm#Florida%20Ped%20Handbook. Alternative Treatments for At-Grade Pedestrian Crossings. Nazir, Lalani for Institute of Transportation Engineers, September 2001. Narrowed and reduced number of motor vehicle travel lanes. Detailed engineering analysis will help to determine the appropriate combination of treatments for a pedestrian crossing.41 These infrastructure improvements, when implemented with education and enforcement programs, can make crossings safer and more convenient for transit customers and can help reduce pedestrian crashes. One critical aspect of pedestrian crossing safety is the sight distance between pedestrians and drivers approaching a crossing. Adequate sight distance should be provided for drivers to see pedestrians entering a crosswalk and stop their vehicles. Sight distance can be limited by hills, curves, buildings, parked cars, landscaping, trees, and other objects. At roadside transit stops, poorly-placed shelters or non-transparent shelters can limit the ability of drivers to see pedestrians at or near the stop. In addition, transit vehicles servicing passengers at stops can block the sight lines between pedestrians crossing the roadway and other approaching drivers. Crossings placed near bus stops in low-density and rural areas may be of particular concern because minimum geometric standards may not be consistently met or maintained and pedestrians arrive less frequently, meaning motorists may be less likely to expect them. Many of the roadway crossing treatments presented in this section can help address these sight distance issues. Legally, crosswalks exist where two streets intersect whether or not they are denoted with markings.42 Crosswalk markings can be used to indicate preferred crossing areas for pedestrians and to help make drivers more aware of pedestrians crossing the roadway. Marked crosswalks are most commonly denoted by standard crosswalks (two parallel lines) or high-visibility crosswalks (thick white bars parallel to the direction of travel, both "continental" and "ladder" style crosswalks). Other crosswalk treatments include different striping patterns, stamped asphalt or pavers, or raised pavement surfaces (raised crosswalks). It is critical that drivers approaching a crosswalk can easily see the crosswalk treatment. High-visibility crosswalks (see photos below) are the most visible to drivers. Accessible curb ramps should be provided at both ends of marked crosswalks wherever the roadway crossing is at a different level than the adjacent sidewalk. All curb ramps should meet the requirements of the ADAAG. Median islands (or pedestrian crossing islands) allow pedestrians to cross one direction of motor vehicle traffic at a time. Studies show that islands can reduce up to 40 percent of pedestrian crashes on certain types of roadways.43 On particularly long crossings, the islands can provide pedestrians with a place of refuge to pause and rest. This is especially important for slow-moving pedestrians who require longer gaps to cross at unsignalized crossings or who may not be able to fully cross the street in the time provided at a signalized intersection. A minimum median width of six feet should be provided in order for the median to be used as a pedestrian refuge. Curb extensions (or curb bulb-outs) can be used on roadways with on-street parking to shorten pedestrian crossing distances and increase the visibility of pedestrians at roadway crossings. By narrowing the curb-to-curb width of a roadway, curb extensions may also help reduce motor vehicle speeds and improve pedestrian safety. Curb extensions at bus stop locations can help preserve on-street parking because fewer parking spaces need to be removed in order for buses to pull to the curb. They may also improve transit operations by enabling a bus to pull to the curb more easily and board and alight passengers more quickly. 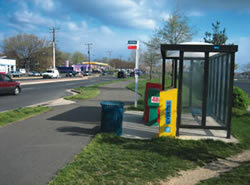 Locating bus stops on curb extensions may have the additional benefit of providing increased clear-width on sidewalks by locating the shelter out of the pedestrian travel way. Wide curb radii allow motorists to make high-speed turning movements. Reducing the curb radii at the corners of an intersection can help reduce the speed of turning vehicles, improve sight distance between pedestrians and motorists, and shorten the crossing distance for pedestrians. It is important to evaluate surrounding land uses and the traffic composition on the roadway (types of vehicles) when considering this treatment. 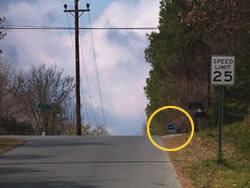 If a curb radius is too small, trucks and buses may have to drive on the curb to turn, which can endanger pedestrians. An engineering study should be conducted to determine the impacts of this treatment on all types of vehicles, including transit, motor vehicles, bicycles, and pedestrians. Pedestrian safety and access near transit stations can be improved by narrowing or removing existing roadway travel lanes. Narrowing travel lanes can provide more space for sidewalks, shoulders, buffers, and bicycle lanes and may reduce motor vehicle speeds on some roadways. Removing travel lanes can be accomplished by eliminating through-travel lanes or replacing a center-turn lane with raised median islands or a median strip. Both treatments can reduce pedestrian crossing distances and exposure of pedestrians to vehicular traffic. Removing travel lanes often requires tradeoffs between travel modes within a roadway corridor. For example, reducing a road from four lanes to two lanes will impact the vehicle carrying capacity of the roadway. Engineering analyses should be conducted to evaluate the impact of removing travel lanes on all modes, including transit, automobiles, bicycles, and pedestrians and on parallel streets. High-visibility pedestrian warning signs can increase driver awareness of pedestrians, especially in areas where pedestrians may not be expected. A fluorescent yellow-green color (W11-2 Pedestrian Crossing Sign) is approved in the national Manual on Uniform Traffic Control Devices (MUTCD) and should be used for pedestrian warning signs (MUTCD Section 2C.41). According to the MUTCD, these signs "should only be used at locations where the crossing activity is unexpected or at locations where street crossings are not readily apparent." These signs are typically most effective when combined with other treatments. Signs should be used judiciously—too many signs can cause visual clutter and lead to non-compliance. "In-roadway pedestrian crossing signs" are bright yellow signs placed in the middle of the road at marked crosswalks. These signs are included in Section 2B.12 of the MUTCD. The signs are designed to remind drivers of their responsibility to yield to pedestrians in the crosswalk by stating, "STATE LAW—YIELD TO/STOP FOR PEDESTRIANS IN CROSSWALK." They should not be used at signalized intersections (MUTCD Section 2B.12). Pedestrian signals should be provided at signalized intersections near transit stops. These signals alert pedestrians to the appropriate time to cross during the traffic signal cycle. It is important to time the traffic signal so that pedestrians of all abilities have enough time to complete crossing the street before opposing traffic is allowed to proceed. Where possible, a median refuge area at least six feet wide should be provided for pedestrians who fail to complete the crossing during the pedestrian phase. Pedestrian countdown signal heads are beneficial at intersections with high pedestrian crossing volumes and/or long crossing distances. Countdown signal heads indicate the number of seconds remaining for pedestrians to complete crossing the street before opposing traffic is allowed to proceed. Signal phasing should balance the available crossing time with the wait time between pedestrian crossing phases. Long wait times may increase the prevalence of pedestrians crossing against the traffic signal. Pedestrian signals can also be combined with traffic signals that restrict vehicles from making turning movements that could impair pedestrian safety. Standards and guidance for pedestrian signal timing are included in the MUTCD (Section 4E.10). At busy midblock pedestrian crossings, pedestrian-activated traffic signals should be considered for regulating vehicular traffic. Extensive guidance and standards for pedestrian signal warrants are provided in the MUTCD (Section 4C). 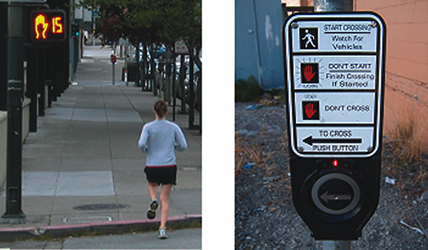 Accessible pedestrian signals (APS) provide audible and tactile indications of the walk interval from a pushbutton. These may be used at signalized intersections to help people with visual disabilities cross safely. Standards and guidance on APS are included in the MUTCD (Sections 4E.06 and 4E.09) and the Draft Public Rights-of-Way Accessibility Guidelines (Sections R208 and R306). Pedestrian overpasses (bridges) and underpasses (tunnels) allow pedestrians and bicyclists to cross streets while avoiding potential conflicts with vehicles. Because they are expensive to construct, grade separated crossings should be reserved for locations where there is high demand for crossings by pedestrians, bicycles and individuals with physical disabilities and the hazards of crossing the roadway are high. Ideally, overpasses and underpasses should take advantage of the topography of a site—grade separations are less expensive to construct and more likely to be used if they can help pedestrians avoid going up and down slopes, ramps, and steps. Grade separated crossings should be located conveniently so that pedestrians are not forced to go out of their way to use them. When a long detour is necessary, pedestrians and bicyclists will often choose to cross at-grade regardless of the safety conditions on the street. The overpass or underpass should provide adequate width (for users to pass each other comfortably), lighting, and surveillance to increase pedestrians' perceptions of security and comfort. In some areas, pedestrians may need to cross railroad or light rail tracks to access a transit station or stop. The design of these crossings is critical, as pedestrian/train collisions typically result in severe or fatal injuries. While most current standards and requirements for railroad at-grade warning systems are tailored to motor vehicle traffic, the Federal Highway Administration's Railroad-Highway Grade Crossing Handbook44 provides guidance about pedestrian crossings. Additional guidance is provided by the MUTCD (see Part 8 and Part 10),45 American Railway Engineering and Maintenance of Way Association (AREMA) Signal Manual (see Volume 1, Section 3),46 and Code of Federal Regulations 49 (see Part 234).47 Different standards apply to at-grade crossings of light rail tracks which often have no gates or warning devices. Railroads shall provide a minimum of 20 seconds of warning time, with the active devices (bells, flashing lights, barricades, etc.) fully deployed five seconds before the arrival of a transit vehicle.45 This gives a pedestrian a minimum of 15 seconds to complete crossing the tracks. Longer crossings may necessitate additional warning time built into the train detection system. In addition to time, the type of surface material used at the rail crossing must be designed in accordance with the ADAAG. At-grade crossings with multiple tracks can present additional dangers to pedestrians who may assume that a warning has been deployed for a train that is currently stopped on one of the tracks when in reality, a second train is also coming on another track. Separate warnings may be necessary for these locations to help alert pedestrians of the full extent of the danger of the at-grade rail crossing. Traditional gate/flasher/bell assemblies —These devices are useful for warning pedestrians of oncoming vehicles, but all of these devices should be considered "supplemental" and are typically deployed as part of an engineering decision or a diagnostic team review. While these traditional devices have been reliable and effective in the past, newer devices are entering the marketplace such as digital voice announcements and strobe lights. Active or Passive Warnings —Active warnings, such as bells or whistles mounted near the crossing or on the train, are recommended at pedestrian at-grade crossings. Passive warnings, such as signs, can also be used. Fencing —Fences can be used to discourage pedestrians from crossing rail tracks in undesignated locations. Grade-separated crossings —Railroad tracks with high-speed and high-frequency train service may require pedestrian tunnels or overpasses to ensure the safety of crossing pedestrians. Surveillance, education, and enforcement —Enforcement can help reduce the number of pedestrians trespassing (e.g., walking along railroad tracks). When considering what, if any, pedestrian warning is to be deployed, a thorough review of the environment around the crossing is recommended. This includes evaluating the frequency of rail service and number of tracks that are present. It is also important that the assessment include land uses and frequently-used pedestrian pathways in the vicinity of the railroad track. Railroads near schools, playgrounds, hospitals, retail centers, and other major pedestrian generators may have a much greater need for safety treatments than a railroad track in a rural setting. Roadways and pathways should be designed to facilitate safe interactions between bicycles and cars, trucks, transit vehicles, and pedestrians. In all areas with expected bicycle traffic, bicycle-specific facilities (e.g., on-street bicycle lanes, climbing lanes, or shared lane pavement markings) should be installed. Any off-street facilities provided for both pedestrians and bicyclists should provide a safe area for bicyclists but not impede or endanger pedestrians. The AASHTO Guide for the Development of Bicycle Facilities48 should be followed during planning, design, and construction projects to ensure that appropriate bicycle facilities are provided. Collision avoidance technology on buses—This system provides operators with an advance warning or alarm when pedestrians or other objects are within close proximity of the bus. Strobe lights on top of buses—The strobe lights are intended to get the attention of pedestrians when buses approach bus stops and shelters. Door safety interlocks—These automatic controls prevent buses from moving once doors are open. Right rear wheel safety guards—These devices can reduce the risk and severity of rear wheel pedestrian accidents. Front brake lights—Brake lights mounted on the front of the bus indicate to pedestrians crossing the street in front of a bus when the bus is stopped and when it has started to move. The location and design of transit stops can significantly impact the safety and comfort of pedestrians accessing transit services. This section describes several considerations that are important to the location and design features of bus stops. Sight lines between approaching buses and passenger waiting and loading areas—Bus drivers and passengers waiting at bus stops should be able to see each other easily to ensure drivers have sufficient time to stop for waiting passengers. Similarly, passengers waiting for a bus should have a clear view of approaching buses so that they do not step into the roadway in front of an approaching bus. Predominant pedestrian patterns along the roadway and at nearby intersections—Bus stops should be positioned in locations that serve the highest numbers of pedestrians, minimize total walking distance, and reduce the number of roadway crossings for pedestrians. Proximity to destinations in the surrounding area—Bus stops should be located to reduce walking distance to key destinations. Where possible, stops serving major pedestrian generators should be located on the same side of an intersection as the destination so pedestrians do not need to cross additional streets to access the stop. Ease of transfers to other bus routes—Stops where pedestrians frequently transfer between different bus routes should be located on the same side of intersections. Locations of traffic signals and other crossing facilities—Bus stops should be located close to adequate crossing facilities to encourage pedestrians to use crossing and reduce jaywalking. 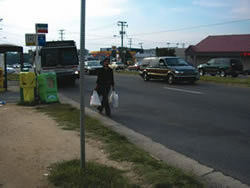 Locations of sidewalks and other pathways that provide access to the stop—Bus stops should be located to take advantage of existing sidewalk and pathway infrastructure and to avoid dropping passengers off where they must walk in the roadway, on embankments, or in dirt, grass, or mud. Location of access driveways– Bus stops next to driveways can block vehicular circulation, inconvenience business owners or motorists using the driveway, and require passengers to wait in a driveway for the bus, elevating the potential for pedestrian/vehicle conflicts. Bus stops should be provided in locations with the safest and most convenient pedestrian access possible. 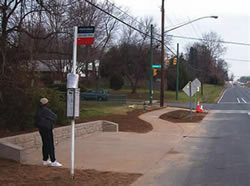 In rural areas with low volumes of transit riders, flag stops are often implemented instead of standard bus stops. This system allows passengers to wait along the side of the road at a convenient location that may not necessarily be a designated bus stop. When the bus encounters a passenger waiting alongside the road, the bus driver can use their professional judgment to determine whether it is safe enough to stop at that location. Transit agencies using flag stops should develop specific policies for drivers and passengers to use for determining when and where it is safe to pick-up or discharge passengers. Transit stop infrastructure is not required for this system, so it is cheaper to implement than the standard system of bus stops used in most urban areas. Because no landing pads, sidewalks or other pedestrian facilities are provided, it is important that pedestrians, drivers and transit operators receive training on safety procedures for using flag stops. At intersections, bus stops can be located either on the near-side or the far-side of the intersection, depending on many factors. Far-side bus stops have the safety benefit of encouraging pedestrians to cross the roadway at the intersection behind the bus. 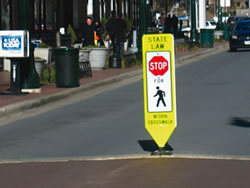 This increases the visibility of pedestrians to drivers traveling through or turning at the intersection. In contrast, pedestrians crossing an intersection in front of a near-side bus stop are not as visible to drivers approaching the intersection from behind the bus. They may also risk being hit by the bus itself. The sight lines between pedestrians and approaching vehicles are blocked by the stopped bus. There is also increased potential for conflict between pedestrians crossing in front of a bus as pedestrians may not be clearly visible to a bus driver pulling out of the stop. Transit stops can also be located at midblock locations. Midblock stops can reduce the distance pedestrians need to travel to reach destinations in the middle of long blocks. However, midblock stops may encourage pedestrians to cross roadways at locations where there is no traffic control. Midblock stops should be designed carefully in order to ensure the safety of pedestrians using the bus. Transit agencies should coordinate with the agency or jurisdiction responsible for the roadway to pursue the installation of proper pedestrian crossing facilities and motorist warning devices before the stop is installed. 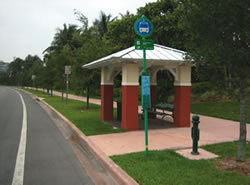 An excellent resource for determining bus stop locations is FDOT's Accessing Transit: Design Guidelines for Florida Bus Passenger Facilities (available online at: http://www.dot.state.fl.us/transit/Pages/AccessingTransitHandbookLow.pdf). 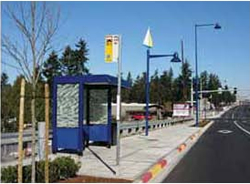 This document includes boarding thresholds for providing facilities at bus stops and flowcharts to help transit planners determine the appropriate bus stop type and location. It also includes a chart displaying advantages and disadvantages of near-side, far-side and midblock bus stop locations (see previous page). Intersection available to assist in pulling away from curb. Conflicts with right turning vehicles are increased. Stopped buses may obscure curbside traffic control devices and crossing pedestrians. Sight distance is obscured for cross vehicles stopped to the right of the bus. The through lane may be blocked during peak periods by queuing buses. Increases sight distance problems for crossing pedestrians. Pedestrians may cross the street in front of the bus, unseen by traffic in the left lane. Minimizes conflicts between right turning vehicles and buses. Provides additional right turn capacity by making curb lane available for traffic. Minimizes sight distance problems on approaches to intersection. Encourages pedestrians to cross behind the bus. Requires shorter deceleration distances for buses. Gaps in traffic flow are created for buses re-entering the flow of traffic at signalized intersections. Intersections may be blocked during peak periods by queuing buses. Sight distance may be obscured for crossing vehicles. Stopping far-side after stopping for a red light interferes with bus operations and all traffic in general. May increase number of rear-end accidents since drivers do not expect buses to stop again after stopping at a red light. Minimizes sight distance problems for vehicles and pedestrians. Passenger waiting areas experience loss pedestrian congestion. Passengers access buses closest to crosswalk. Requires additional distance for no parking restrictions. Encourages patrons to cross street at mid-block. Increases walking distance for patrons crossing at intersections. This chart lists some of the advantages and disadvantages of near-side, farside, and mid-block bus stop locations. Source: Accessing Transit. Florida Department of Transportation, March 2004. Department of Transportation and Florida State University, Tallahassee, Florida, 2004. http://www.dot.state.fl.us/Transit/Pages/AccessingTransitHandbookLow.pdf. Maryland Transit Guidelines. 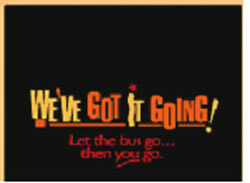 Maryland Transit Administration, 2002. PEDSAFE: Pedestrian Safety Guide and Countermeasure Selection System. US Department of Transportation, Federal Highway Administration, Authors: D.L. Harkey and C.V. Zegeer, September 2004. http://www.walkinginfo.org/pedsafe/. Project ACTION: Toolkit for the Assessment of Bus Stop Accessibility and Safety. Easter Seals, 2006. http://projectaction.easterseals.com/site/PageServer?pagename=ESPA_BusStopToolkit. District of Oregon, Portland, Oregon, 1996. Provides easy access for bus drivers and minimal delay for bus; Simple in design, easy to install and relocate; Most common type of stop; No parking zone will require loss of on-street parking. Traffic can back up behind the bus; Auto drivers may make unsafe movements to avoid being caught behind the bus; No parking zone will require loss of on-street parking Most common type of stop; See following page for more detail. Removes fewer parking spaces; Improves pedestrians movements at the intersections; Provides additional sidewalk area for pedestrians; results in minimal delay for the bus For existing development, there would be some construction cost; Traffic can back up behind the bus; Auto drivers may make unsafe movements to avoid being caught behind the bus There is adequate space in the right of way and sidewalk can be altered; Nub design also works well for pedestrian crossings at the corner. Passengers get on and off the bus away from the travel lane; Minimizes delay to through traffic Bus drivers may have problems merging back into traffic; For existing development; there would be some construction cost; Alters the street and sidewalk. There is no on-street parking; There is high volume of traffic; Street traffic speeds are 40mph; Traffic exceeds 250 vehicles during the peak hour; Bus needs layover time at end of route. Has same advantages of Bus Bay and Open Bus Bay, PLUS Allows bus to bypass traffic queues at a signal May cause delays to right-turning vehicles; For existing development, there would be some construction cost; Alters the street and sidewalk There is no on-street parking; There is a high volume of traffic; Street traffic speeds are 40 mph; Traffic exceeds 250 vehicles during the peak hour; Bus needs layover time at end of route. ADA guidelines (10.2.1) require a landing pad to be located at all bus stops to allow pedestrians to enter and exit the bus safely without entering the street. This landing pad must have a firm, stable surface that is free of obstructions. It must have a minimum length of eight feet (from the curb or roadway edge) and a minimum width of five feet (in the direction parallel to the roadway).53 It must also be connected to the adjacent sidewalk network. In addition to satisfying ADA guidelines, properly designed landing pads create a safe place for pedestrians to wait away from grass, mud, and traffic. Bus drivers should have a clear sight line to the bus stop or shelter, so that they have sufficient time to see and stop for passengers. Passengers waiting at the bus stop and in the shelter should have sufficient time to see and hail the bus, especially at bus stops serving more than one route. Bus shelters should be transparent and well lit. Signage can be useful for pedestrians accessing transit stops and stations by clearly identifying routes and destinations. Pedestrians who know where they are going are less likely to be distracted and better able to focus on their personal safety while walking. Two common types of signs are identification (i.e., bus stop and transit stop sign posts) and wayfinding (i.e., maps and direction) signs. Identification signs should be provided at all stops and stations and they should be recognizable signs that are visible to both pedestrians and transit drivers.57 These identification signs may also provide schedules and other information about the transit routes that serve the particular stop or station. At stations with high passenger volumes, it may be appropriate to provide signs that display real-time information about bus/train arrival times. Wayfinding signs are important for providing pedestrians with directions to local destinations and information about points of interest in the area. Both maps and signposts can provide wayfinding information. A transit agency may coordinate with local jurisdictions on the design, content, and installation of wayfinding signs that serve a certain area, such as directional signage in a historic district. It is recommended that signage be available and accessible to all potential passengers including those with visual impairments (through the use of audio or tactile signage) and those who cannot read English (through the use of pictograms, graphics and text in other languages). Clear sight lines into and out of waiting areas (including shelters). Landscaping that does not create dead-ends or hiding places. All of the elements of bus stop design that have been discussed in this section should have routine maintenance to ensure continued functionality and safety of pedestrians. This includes updating maps, emptying trash cans and picking up litter, removing ice and snow, trimming landscaping, cleaning glass walls, and repairing signs, benches, landing pads and shelters. Agencies should account for maintenance costs when planning bus stops and stations. In addition to performing maintenance internally, some transit agencies utilize adopt-a-stop or adopt-a-station58 programs or contract maintenance out to advertisers to ensure continued upkeep. The Greater Cleveland Regional Transit Authority (GCRTA) has recognized that transit stop design is a critical element of the transit riding experience. The 2004 project, Transit Waiting Environments, is a guidebook that encourages local communities to take a more active role in the design of their local transit stops. The guidebook discusses many aspects of stop and station design including the location of stops, stop identification, signage, stop amenities and conveniences and development patterns around transit stops.60 A hierarchy of stop designs was developed to help determine which amenities should be provided at each stop. The book was distributed to local government planning agencies and community groups throughout the GCRTA service area. Individual communities have been encouraged to use the principles and ideas presented in the book and adapt them to fit their context. The City of Shaker Heights has already implemented the program at one of its busiest stops by improving sidewalks and street crossings and adding seating elements as shown in the photos above. 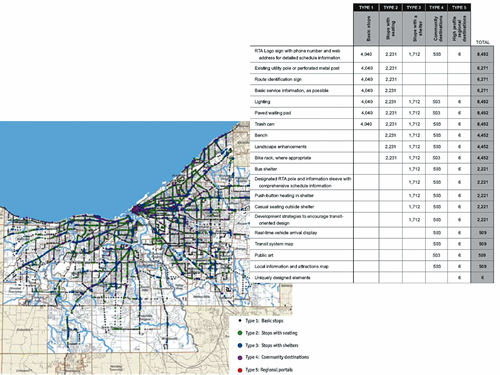 As of 2007, GCRTA has contracted with a consultant to formally implement the Transit Waiting Environments project at stops throughout the service area. Contact: Joyce Braverman, Director of Planning for Shaker Heights, joyce.braverman@shakeronline.com. and Maribeth Feke, GCRTA's Director of Planning and Programming, MFEKE@gcrta.org. The Transit Authority of River City (TARC) in Louisville, Kentucky provides free "Hop on Board" presentations at schools.65 The presentations include a TARC activity book for each student and can be taught on board a TARC bus. Understanding train operations (that trains cannot stop fast or swerve). Being aware of railroad bridge and trestle hazards. It is also important for transit agencies to coordinate with local transportation departments and other organizations that offer pedestrian safety education and materials that focus on reducing conflicts between pedestrians and all types of motor vehicles that use the roadway (e.g. USDOT, NHTSA, State DOTs). While pedestrian collisions with transit vehicles are an important safety issue to address, most pedestrian fatalities are a result of crashes with cars and light trucks.67 Transit agencies should be a partner in these education and safety awareness efforts because their customers often face conflicts with motor vehicles when traveling to transit stops and stations. Local governments around the Washington, DC, Metropolitan Area joined forces to implement the StreetSmart Campaign to improve bicycle and pedestrian safety in the region. The goal of this multi-year campaign is to increase awareness of bicycle and pedestrian safety issues thereby reducing the number of crashes and fatalities through enforcement and education. Enforcement of pedestrian-related traffic laws is increased for one month each spring, timed to coincide with a publicity blitz. 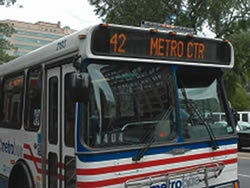 The Washington Metropolitan Area Transit Authority (WMATA) has participated in these outreach activities. StreetSmart enforcement and education activities complement engineering projects (such as improved signalization and improving crosswalk visibility) completed throughout the year by local jurisdictions. Pedestrian/bicycle enforcement training for police officers. 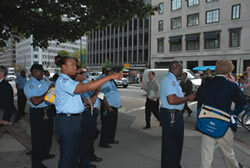 District of Columbia police officers handed out over 2,500 citations and distributed more than 9,000 safety handouts. Newspaper advertisements (English and Spanish language publications). Outdoor posters on buses and shelters. 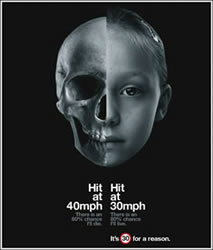 Frequently observe drivers not yielding to pedestrians (76% in 2002 to 54% in 2006). Drivers swerving to avoid pedestrians (32% in 2004 to 14% in 2006). Frequently observe pedestrians jaywalking (40% in 2002 to 30% in 2006). In 2008 the program will be expanded to include a bi-annual campaign. In addition, WMATA will expand its role from participating only in outreach to become a full funding partner of the program. 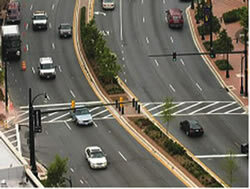 More information is available at: http://www.mwcog.org/streetsmart/default.asp.